Our book is the culmination of many years of research combined with real-life classroom experience. Readers will gain an understanding of how 4C methodology works and how it can be applied to any learning environment. 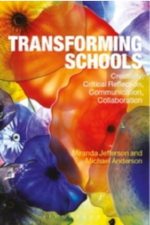 Transforming Schools is available in e-book, hardback and softback from Bloomsbury Australia. For bulk orders contact Neil Godwin at Bloomsbury Australia neil.godwin@bloomsbury.com. Please let us know what you think of the book and if we can help you with ideas for transforming your school.